Researchers are in the comfortable position to be able to choose from a diversity of cloning and expression systems for building complex multi-gene assemblies. Yet, proprietary designs often run contrary to efforts towards standardizing assembly strategies. Some plasmid lay-outs accomodate compatibility, but truly universal systems are hard to come by. ATG:biosynthetics GmbH has developed a vector assembly system with standardized modular elements that adhere to a uniform design logic. 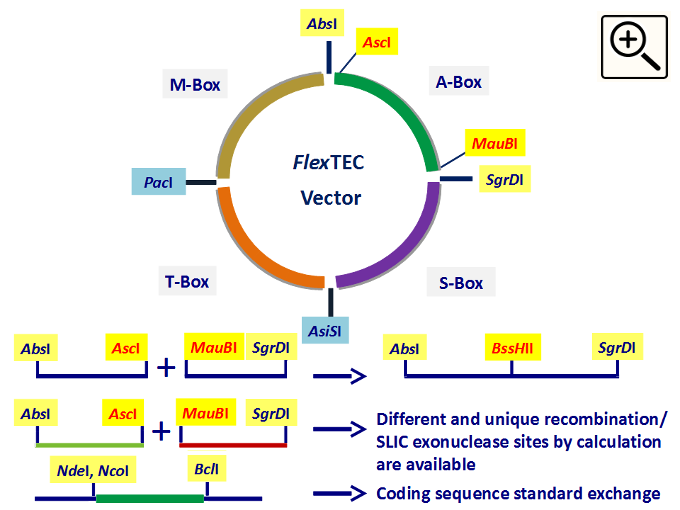 This flexTEC system allows easy modification, exchange, addition, removal and regeneration of components or higher-order gene assemblies. This system has been de-signed with the idea of an industrial standard in mind and has successfully been implemented for multi-gene assemblies in metabolic engineering of bacteria. AbsI(XhoI) and SgrDI(SalI) are compatible sites which can be used to combine several multi-gene constructs assembled by AscI(BssHII) and MauBI(BssHII). In addition theses sites are flanking theAbsI(XhoI)-Rc-x- AscI(BssHII) and MauBI(BssHII)-Rc-y- SgrDI(SalI) recombination sites for (toggle) recombination assembly. SgrDI-S-BoX-AsiSI – selector elements are available for various resistance genes. AsiSI-T-BoX–PacI – transfer elements (like: shuttle host oris, oriV, oriT or recombination sites) etc. can be toggle assembled to contain multiple functional transfer elements. The PacI-M-BoX-AbsI(XhoI) vector mainatenance box (ColEI*high copy) can be equipped with alternative oris like p15a, R6Kgamma, RK2 etc. are all designed according to the same advantageous basic modular principle. integration of additional functions easily implemented, e.g. exonuclease cloning-ready sequences, additional restriction sites, etc. Integrated option for full diassembly of multi-gene expression assemblies. Any gene cassette from a multi-gene construct can, if based on the ACDC-S design, be released with one restriction digest. The Toggle vector system allows completely modular exchange of all types of genetic functions (gene cassettes, promoters, terminators, oris, recombination signals, etc.) and can be adapted to and applied for the modulation of any organism's genetic system. Using a unique standardized and modular vector system that incorporates/covers restriction-ligation, exonuclease and even recombineering-based cloning strategies in vivo and in vitro has the advantage of saving cost and time that streamlines all procedures. The free exchangeability of functional genetic elements (FunGenEs) between researchers/ developers who work with the same standard reduces the redundancy of labor and purchasing costs of genes. TOGGLE Assembly Systems adhere to a standardized unified constructive principle. 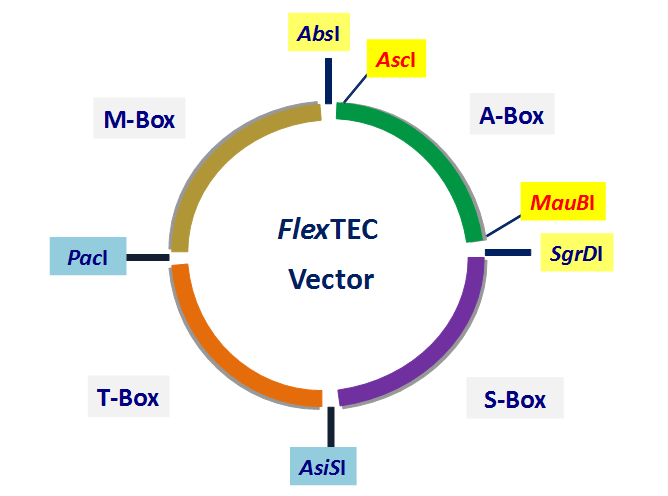 Toggle plasmid vectors generally consist of four modular elements: applications (A-Box), selectors (S-Box), as well as target (T-Box) and maintenance (M-Box) functions (see fig. 1). The system is designed as an open standard for the synthetic biology research community but also to researchers in other fields, academic as well as industrial. The standard encourages more intense exchange of parts and modules between researchers. Modules, especially in the A- and T-Box, can be flexibly exchanged through defined and standardized restriction - ligation cloning. Elements within the individual modules can be added, removed, exchanged in the same way. Toggle comes in different flavors: either as ready-to-use system (for E. coli, insect and mammalian cells) or it can be designed to incorporate customer-specific features or be adapted to your target organism of choice. Customer genes should be optimized to not interfere with the constructive principles of the system. As the modules are separated by rare-cutting enzymes, most genetic design will be easily implementable. will allow you to build multi-gene constructs using only two antibiotic markers. will allow you to add functional elements at a later stage. If you want to know more about the system, please download our product description. Currently, we have two ready-to-use versions of the Toggle system (the so called flexTEC line of expression systems). One for E.coli and one for insect cells. In principle, Toggle can be custom-adapted to any organism that can be genetically modified.